Khaled Fahmy’s fascinating and important new book addresses fundamental questions about the nature of Egypt’s modernity. 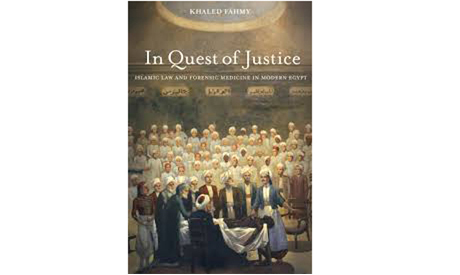 Tracing the origins of forensic medicine to the middle of the 19th century (1830-1880), Fahmy offers a revisionist account of the origins of the modern Egyptian state and its relationship to Islamic law. Critical of modernisation theories of both the right and left as well as of Islamist critiques of the legitimacy of Egypt’s path to modernity, Fahmy suggests that Egypt under the descendants of Mohamed Ali and before the British occupation of 1882 pursued a self-confident programme of modernisation that continued to regard Islamic law as a foundation for justice while borrowing scientific techniques from Europe without fear of cultural contamination. Fahmy is best known for his history of Mohamed Ali’s army All the Pasha’s Men in which he argued that the pasha’s imperial project centred around the construction of an army of Egyptian peasant conscripts. Other reform projects, such as in education and industry, were subordinated to the building of an army that Mohamed Ali used to carve out a hereditary governorship in Ottoman Egypt and Sudan. Fahmy argued that Mohamed Ali’s project was best understood within the larger context of Ottoman reform and modernisation in the 19th century. As influential as some of his policies were, Mohamed Ali was not the founder of modern Egypt, if for no other reason than that he did not identify with his Egyptian subjects. Furthermore, many of the policies he pursued, including the construction of a large army, had to be scaled back, and it was only in the middle of the century that a modern bureaucratic state was born. In his new book, Fahmy begins with Clot Bey, the French physician whom Mohamed Ali employed to modernise medical practice in Egypt. In a famous incident, Clot Bey claimed to have been attacked by a religious fanatic who opposed his teaching of dissection. This incident is supposed to demonstrate the opposition of traditional Islamic religious authorities to the practice of dissecting corpses, and by extension, to the introduction of modern medicine. Fahmy goes on to demonstrate that this interpretation is a myth. Although 19th century Egyptians had the same reluctance to desecrate the body of a deceased person that existed in other cultures, there was no widespread opposition to dissection. The principal students of dissection were in fact students at Al-Azhar who thought nothing of acquiring human bodies for this purpose and even dissecting them at home. So much for Islam’s irrational resistance to scientific progress. One of Fahmy’s key assertions is that 19th century Egypt cannot be considered a colony, and therefore the framework of post-colonial studies is not appropriate to study it. Egypt’s rulers pursued their own programme of modernisation, one that did not depend on the bifurcation of society between coloniser and colonised. As a result, Cairo was not divided into European and native quarters, and medical reforms were not implemented with the primary purpose of protecting Europeans from native diseases. Instead, Egypt’s rulers and reformers pursued a pragmatic policy of adopting European ideas and institutions as they saw fit. This was no simple replacement of Islamic institutions with “modern” European ones. Islamic law continued to play a crucial role in the justice system, albeit along new practices based on modern medicine. Fahmy offers a long-overdue critique of Talal Asad’s argument that the advent of secularism in Egypt was characterised by a separation of ethics from Islamic law. According to Asad, where once Islamic law (fiqh) was a means to pursue personal virtue and salvation, these pursuits were now relegated to private life. Under the influence of European legal systems, the modern Egyptian state-enforced law without regard for its original ethical content. Fahmy argues that Asad’s depiction of pre-modern Islamic law is idealised and fails to take into account the role of the state in legislating Islamic law. Fahmy’s critique is informed by the latest arguments in the debate about the relationship between fiqh/sharī a and siyāsa. Until relatively recently, modern scholarship considered siyāsa to be a type of secular law that gradually restricted the scope of Islamic law as elaborated by the jurists. Siyāsa was promulgated by rulers, most famously in the form of qanoun, the body of laws promulgated by Ottoman sultans. In this narrative, Islam has been gradually displaced as the source of law-making and ethical norms. For Western-influenced modernisers, this process results from the antiquated character of Islamic legal institutions that constitute an impediment to modernising reforms. Law must be thoroughly secularised to become fully modern. For Islamists, the marginalisation of Islamic law is indicative of the illegitimate and inauthentic character of modernity in Egypt. The solution is a “return” to Islam as the ethical and legal foundation of the state. Fahmy follows a number of legal historians such as Kristen Stilt and James Baldwin who have shown the overlapping character of fiqh and siyāsa in Egypt in the Mameluke Sultanate and 18th century, respectively. On this basis, Fahmy calls into question the modernity of the separation of ethics from law. Indeed, under the Ottomans, judges also served as administrators with important roles to play in matters such as taxation. An additional area, not considered by Fahmy, is the long tradition of non-Muslims using Islamic courts to pursue their own ends. In the 18th century, for example, we have evidence from the Cairo court registers of Christians and Jews marrying, divorcing, and practicing polygamy under Islamic law. Islamic law, or perhaps Ottoman law if one includes qanoun, was the shared legal framework of all Ottoman subjects in Egypt. The relationship of non-Muslim Egyptians to Islamic law must have changed significantly over the course of the 19th century, but they are missing from Fahmy’s account. In any case, Fahmy argues persuasively that siyāsa and fiqh co-existed in 19th century Egypt. In a crucial chapter entitled “Siyāsa: The Forgotten Code,” Fahmy uses the registers of the Majlis Al-Aḥkām to illustrate how techniques of forensic evidence were introduced into the Egyptian legal system. Cases were first referred to qāḍī courts that ruled in accordance with fiqh requirements. These courts relied overwhelmingly on testimony by witnesses and confessions. Confessions obtained through coercion were invalid in qāḍī courts, and eyewitness testimony could be hard to come by, especially when the malefactor was a powerful member of society, such as a village umda, who could retaliate. Furthermore, qāḍīs could not initiate investigations into cases, they could only respond to claims that a crime had been committed. The siyāsa councils, on the other hand, had broader powers to initiate investigations and greater latitude with regard to the evidence they could accept. The system of dual courts appears to have been a mid-19th-century innovation, which came into being to enforce a new code of criminal law and which required a bureaucracy of unprecedented size and complexity. In spite of this, as Fahmy notes, many of the new measures to monitor and control the population had earlier precedents. Similarly, when discussing the birth of modern urban planning in Cairo, Fahmy shows that the concepts in use, such as the term umrānīya, had Islamic precedents and resonances. Miasma theory continued to play an important role in physicians’ understanding of the causes of disease and unprecedented efforts were made to cleanse the city of dangerous odours. In spite of the planners’ anxiety, however, Cairo was no more disease-ridden than most large cities of its time, including in Europe. Indeed, its death rate per 1,000 persons was less than that of cities such as Berlin, Rome and Vienna. In taking up the cause of public health, Fahmy argues, the 19th-century Egyptian state took on many of the traditional functions of ḥisba, including the regulation of marketplaces and food production. Now, instead of a religious official (the muḥtasib) and his assistants, police and professional hygienists regulated food production and sale in the marketplace. The moral/religious aspects of ḥisba were dropped and a new class of professionals came into being. If the muḥtasib lost his relevance, however, one wonders how the increased state regulation of religious practice fits into Fahmy’s model. In a classic study published close to 50 years ago, Frederick de Jong showed that beginning with Mohamed Ali, the Egyptian state took an increasing interest in monitoring the practices of Egyptian Sufis. This regulation of religious practice involved the creation of a new position, the sheikh mashāyikh al-Ṣūfīya, who was responsible for policing the behaviour of Sufi orders and for the conduct of visitors to shrines and participants in religious celebrations, such as mūlids. A number of Sufi practices were labeled contrary to Islamic law and banned. These developments fit well into the model of an increasingly bureaucratic state that sought to regulate all aspects of public life. They also call into question the argument that Islamic law and ethics were increasingly separate. The ambition to modernise religion by “returning” to a pristine religious practice supposed to characterise early Islam has been a consistent goal of religious reformers ever since and has often influenced state religious policy. In another important chapter, Fahmy addresses the use of corporal punishment and torture in the 19th century. To some degree, this is a story made familiar by Michel Foucault’s famous study Discipline and Punish, in which the public infliction of pain is replaced by imprisonment, with the intention of reforming the offender through a number of disciplinary techniques. Fahmy also shows that while the use of torture to obtain confessions was a legal and publicly acknowledged practice in the siyāsa councils, there was increased skepticism about the reliability of confessions obtained through torture. The introduction of forensic evidence provided a viable alternative to coercing confessions by suspects. Although qāḍīs were prepared to accept medical testimony in their courts, it was siyāsa that provided the framework for the employment of specialised doctors who provided expert forensic evidence to the siyāsa councils. Fahmy concludes his study with a paradox. On the one hand, he notes, the modern Egyptian state was not created to address the needs of ordinary Egyptians. Instead, it tried with considerable success to make their lives legible through an increasingly complex and intrusive system of bureaucracy and control. On the other hand, the new institutions and practices also opened up new opportunities for Egyptians to pursue justice and demand that wrongs be righted and malefactors punished for their deeds. In Fahmy’s account, the search for justice was increasingly embodied in institutions. One wonders to what degree 19th-century Egyptians continued to see the provision of justice as the personal responsibility of the ruler, in accordance with long-standing Ottoman ideology and practice. Fahmy prefers to focus on the implications of the creation of a modern state for ordinary Egyptians as revealed in the archival record. The result is a complex, nuanced account of the implications of Egypt’s entrance into modernity, one which rejects the tragic narratives of failed or inauthentic modernisation without being naïve about the powers invested in the modern state.